One story about Sisyphus involves Autolycus, a clever thief. Autolycus stole cattle by changing their color so that they could not be identified. Sisyphus outwitted him, however, by placing a mark on the cattle's hooves so that he could follow the hoofprints to the stolen animals. In another myth, Sisyphus saw Zeus* kidnap a river nymph, but he promised to keep the hiding place secret. He betrayed Zeus, however, when he revealed the location to the nymph's father in exchange for a spring of pure water. Furious, Zeus sent Thanatos* (death) to take Sisyphus to Hades*. The clever Sisyphus managed to tie up Thanatos, and for days no one on earth died. Ares* went to free death and take Sisyphus to the underworld. Sisyphus called out to his wife not to bury him, and he persuaded Hades, ruler of the underworld, to let him go back to earth long enough to arrange a proper funeral. After returning to Corinth though, Sisyphus stayed there until his second, and final, death. As punishment for tricking the gods, Sisyphus was placed on a hillside in the underworld with a heavy boulder above him. To escape being crushed, he had to push the boulder uphill. The gods told him that if he rolled the stone to the other side they would release him. Each time he reached the top, though, the boulder rolled back down to the bottom, forcing Sisyphus to start over. The phrase "labor of Sisyphus" refers to any hopeless task that must be repeated endlessly. See also Greek Mythology ; Hades ; Thanatos . 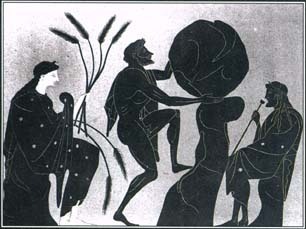 One well-known Greek myth involves the punishment of Sisyphus, a human. After tricking the gods, Sisyphus was ordered to push a boulder uphill. But each time he reached the top of the hill, the rock rolled back to the bottom, creating endless punishment for Sisyphus. Is there a name for the hill up which sisyphus was destined to push the boulder?